There’s not much else to say about these cookies. They’re nothing to gush or mull over. They are just nice, simple little two-bite treats. Or one bite treats, depending on which of the two methods I describe most suits your fancy. I think I preferred the quick and easy version. They were a little softer, and you could pop them into your mouth whole, which is fun, and they were ready quickly. But the more involved version definitely looks more involved, and is certainly as delicious as the former, so if you want the less rustic, more polished look, go for the rolled, chilled, and sliced version. I altered a recipe from David Lebovitz to make these. My alterations are as follows: I halved the recipe because I don’t need 50 cookies hanging around my house (although, I think either his recipe yields way more than 50 cookies or he made much larger cookies than I did, because I already made over 20 and I have half of my own dough in the freezer still); I substituted honey for sugar, because I think honey and cornmeal go together v. nicely (e.g. cornbread + honey butter); and I, of course, used dried apricots in place of currants. 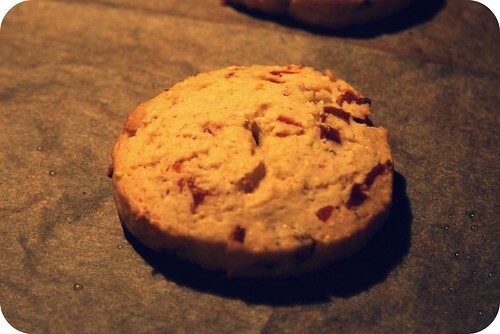 My cookies look much softer than his, and I imagine it’s because of the honey. Also: I’ve almost used the last of my dried apricots! Yay! I have to go get a Christmas tree now. Enjoy the recipe. If you plan on making the easy version, preheat oven to 325 degrees. 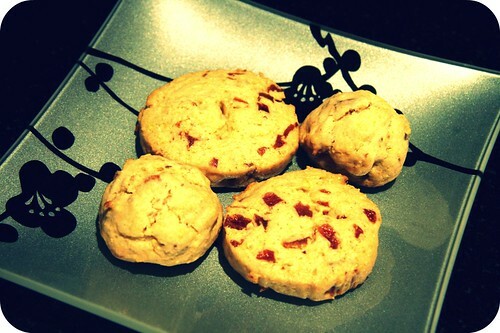 If you make the more polished version, preheat the oven about fifteen minutes before you plan on baking them. In a bowl, toss the dried apricots with the 1 tablespoon flour and set aside. In a mixing bowl, cream together the butter and honey. Add the egg and vanilla and stir until well-combined and a little fluffy. In a separate bowl, whisk together flour, cornmeal, baking powder, and salt. 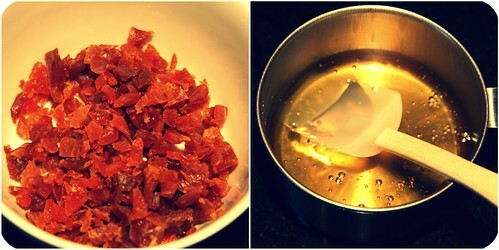 Add dry ingredients to wet, stirring until incorporated, and then stir in the dried apricots. The dough will be quite sticky, so you might want to flour your fingers a bit. To make the rolled, chilled, and sliced version, place a sheet of plastic wrap on the counter, then gather the dough into one large ball and place it in the center of the plastic wrap. Fold up the edges to create as much of a disk-type shape as you can. Put the disk in the refrigerator and chill for about an hour. Once the dough has chilled and is solid enough to handle, remove from the refrigerator and unwrap. Using your hands, shape the dough into a tube, about 2″ in diameter. Wrap and chill again for about an hour. 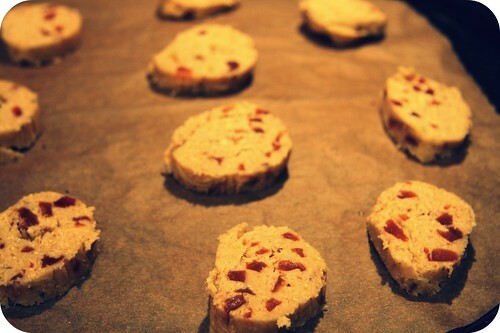 (Or freeze the dough for later – this is what I did.) 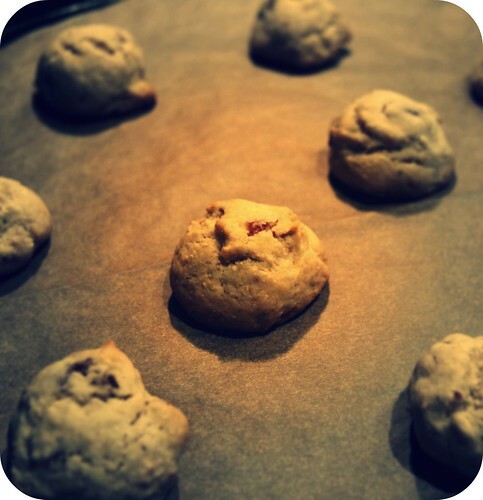 When you are ready to bake the cookies, slice them about 1/4″ thick and place them on a parchment- or Silpat-lined cookie sheet. Regardless of which version you opt to make, bake for 10 minutes. 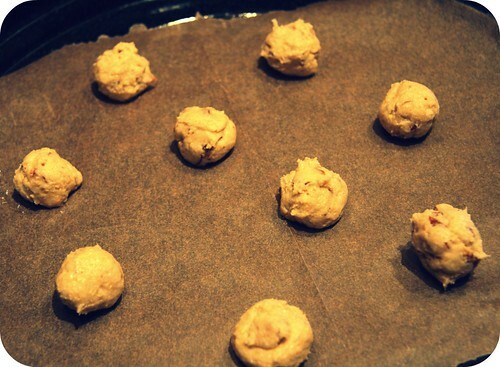 (Even using the frozen dough, they still took only 10 minutes.) Allow to cool on cookie sheet for a few minutes. Get your hot beverage ready and enjoy.